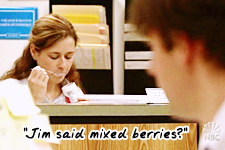 Pam Pong is a supplementation to the episode recaps, listing the Jim/Pam actions of each episode and giving each action a point value. Mostly silly, shippy fun but also a little check list of JAM moments. Final Score: Zero: Separately Jim and Pam seem rather apathetic about their jobs, but when they’re interacting with each other, both of their faces light up and they clearly provide each other a bright spot in the dullness of their workdays. However their cute interactions are negated by Pam’s long engagement to Roy and the newly arrived cameras, which make Pam very uncomfortable. No real progress this round. Thank you! I started this series ages ago but am excited to bring it over here, plus it’s a good excuse to rewatch episodes!